Long before evolutionists knew much about proteins and nucleic acids, they recognized the value of small molecules for chemotaxonomy and for inferring phylogenetic relationships (1,2). They expected that organisms related by divergence from a common ancestor would produce related molecules, i.e. shared characteristics define certain clades. The distribution of many small molecules supports this logic. For example, all vertebrates use phosphocreatine as an energy source during short bursts of activity while various groups of invertebrates use other phosphagens such as phosphoarginine (1,3). On the other hand, after studying bacteria, fungi, and plants, Nes and Nes (4) concluded that the distribution of various lipid molecules does not conform to the usual interpretations of phylogeny. They found similar lipids in distantly related organisms. What evolutionary processes could explain the unexpected presence of similar or identical molecules in distantly related organisms? It may seem likely that the lengthy metabolic pathways required to synthesize particular terpenes, steroids, alkaloids, pigments and other small biological molecules would evolve only once and be retained by divergent evolution from a common ancestor. However, that assumption neglects the potential for convergent evolution given the strong selective pressure to produce a limited number of functionally important molecules and the fact that selection can act over million of years on countless organisms. A careful study of biosynthetic pathways in different organisms reveals that ubiquitous molecules like NAD (5) and lysine (6) can be made in different ways. These and other examples suggest that dissimilar organisms can possess identical small molecules as the result of convergent evolution. The evolutionary process leading to a complex metabolic pathway probably occurs in stages and takes time. However, a biosynthetic capacity can be lost with a single mutation that even may have a selective advantage (7). The distant ancestors we share with other metazoans appear to have lost many biosynthetic pathways possessed by their unicellular ancestors (8) as a consequence of diets rich in vitamins and amino acids. Such selective losses can further confound the evolutionary interpretation of the distribution of small molecules even among related organisms. Conversely, selective gains via horizontal gene transfer or plasmid aquisition offer ways for organisms to acquire traits that do not come from immediate ancestors. The fact that most plants contain chlorophyll and most eukaryotes contain cardiolipin highlights yet another evolutionary phenomenon affecting the distribution of small molecules--endosymbiosis (9,10). A great deal of evidence supports the hypothesis that chloroplasts and mitochondria evolved from free living microorganisms that merged their respective metabolic abilities with a large host cell in an intracellular symbiotic relationship more than two billion years ago. These organelles now are integral parts of eukaryotic cells but contain small molecules that belie their prokaryotic origin. There are examples of other endosymbioses that are restricted to a limited range of hosts yielding animals that can photosynthesize (11) or live on H2S, O2, and CO2 (12). In some cases the distribution of small molecules indicates "you are what you eat." Various species of milkweed (Asclepius spp.) produce distasteful toxic cardiac glycosides and thereby protect themselves from many herbivores (13). Several species of insect have independently (convergently) evolved resistance to these compounds and now feed preferentially on milkweed. Among these is the well known monarch (milkweed) butterfly (Danaus plexippus) (14) that harmlessly incorporates cardiac glycosides into its own body (15,16). While natural selection normally favors forms and colors that conceal (17-19), chemically protected animals (e.g. skunks) benefit from advertizing. These aposematic organisms include the monarch butterflies and other insects that feed on milkweed and share its toxins. Predators quickly learn to recognize and avoid these brightly colored insects (20). Other organisms such as the viceroy butterfly, Limenitis archippus (21), that do not feed on milkweed and may or may not contain other toxic compounds (22) mimic the monarch butterfly and escape predation. While the transfer of certain cardiac glycosides produced by the milkweed to other organisms through feeding is well understood, the scattered occurrence of other toxins among marine and terrestrial vertebrates around the world cannot be explained so easily. In Japan the pufferfish, Spharoides rubripes, is prized food that must be prepared by licensed cooks who know how to remove the poison-containing ovaries, liver, and skin. Nevertheless each year many people die from eating improperly prepared fugu. The poison is tetrodotoxin, a potent neurotoxin that blocks ion channels (24,25). Anthropologists believe that tetrodotoxin in pufferfish from Haiti is actually used to produce zombies (26). Tetrodotoxin also occurs in an unrelated fish, Gobius crininger, in eggs and embryos of the Pacific Coast salamander, Taricha torosa (24), in the venom of an Australian octopus, Hapalochlaena maculosa (27), and in poison-dart frogs of the genus Atelopus (28). 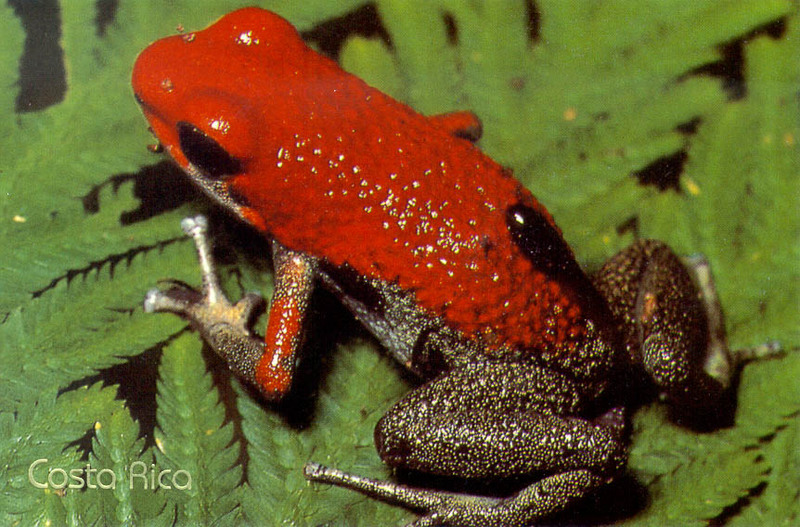 Curiously, a chemically unrelated but potent neurotoxin, homobatrachotoxin, is found in other aposematic Central American poison-dart frogs (29) and this same compound has recently been isolated from the feathers and skin of the Pitohui, a brightly colored poisonous bird from New Guinea (31-33). These animals don't look like each other and don't live near each other, yet they contain the same toxic compound. The structures of tetrodotoxin and homobatrachotoxin are given below. Consider the phylogenetic distribution of homobatrachotoxin and, in your group, formulate a hypothesis to explain the distribution; i.e., does divergence from a common ancestor, convergence, endosymbiosis, transfer in the food chain, horizontal gene transfer, or some other process best explain the observations? Identify and assign learning issues within your group to pursue before next class. For next class, design experimental tests of your hypothesis that can be evaluated by the whole class. Go to the library and find out if anyone has done the experiment. (Due Monday, September 23) Based on your reading and group discussions on tetrodotoxin, write a ~3 page paper discussing which hypothesis you personally favor to explain homobatrachotoxin's distribution in nature. Why do you favor it over the others? What evolutionaly biochemical adaptations might be expected? Provide a reasoned argument including relevant references to recent articles. Would you expect the story to be similar for tetrodotoxin? Assume you have unlimited resources but only one year to test your hypothesis. What experiments would you do? What kinds of results would be consistent with your hypothesis and inconsistent with the others? PLEASE, if you photocopy articles in the library, carefully reshelve the volumes to their proper place in the stacks so that others may have access to them. It often takes the library staff several days to return volumes to the stacks. You may discover that the article you want is in the Morris Library Archives and it takes 24 hours to retrieve it. Thus don't wait until the last minute to get started and share resources. The most recent reference below was published in 1993. Thus, part of your effort will be to search the more recent literature using PubMed, the Web of Science, or some other search engine. Developing the ability to efficiently track down articles in the primary literature is an important skill for people in the sciences. NOTE: Many years ago before photocopiers were generally available in the library, some student in this class tore out all or parts of some of the articles on the reference list below. They thereby deprived all subsequent students of these resources. Such behavior is reprehensible and is grounds for expulsion. 1. Baldwin, E. (1937) An Introduction to Comparative Biochemistry, Cambridge University Press, Cambridge. 2. Alston, R. E., Mabry, T. J. and Turner, B. L. (1963) Perspectives in chemotaxonomy, Science142, 545-552. 3. Watts, D. C. (1971) Evolution of phosphagen kinases, pp. 150-173 in Biochemical Evolution and the Origin of Life, (E. Schoffeniels, ed.) North-Holland Pub. Co., Amsterdam. 4. Nes, W. R. and Nes, W. D. (1980) Lipids in Evolution, Plenum Press, New York. 5. White, H. B., III (1982) Biosynthetic and salvage pathways of pyridine nucleotide coenzymes, pp. 225-248 in The Pyridine Nucleotide Coenzymes (J. Everse, B. Anderson and K.-S. You, eds.) Academic Press, New York. 6. Vogel, H. J. (1965) Lysine biosynthesis and evolution, pp. 25-40 in Evolving Genes and Proteins (V. Bryson and H. J. Vogel, eds.) Academic Press, New York. 7. Zamenhof, S. and Eichhorn, H. H. (1967) Study of microbial evolution through loss of biosynthetic functions: establishment of "defective" mutants, Nature 216, 456-548. 8. Lwoff, A. (1943) L'évolution physiologique, Étude de pertes de fonctions chez lez Microorganismes, Herman, Paris. 9. Margulis, L. (1981) Symbiosis in Cell Evolution: Life and Its Environment on the Early Earth. W. H. Freeman Press. 10. Uzzell, T. and Spolsky, C. (1974) Mitochondria and plastids as endosymbionts: A revival of special creation? American Scientist 62, 334-343. 11. Trench, R. K. and Gooday, G. W. (1973) Incorporation of [3H]-leucine into protein by animal tissues and by endosymbiotic chloroplasts in Elysia viridis Montagu, Comp. Biochem. Physiol. 44A, 321-330. 12. Childress, J. J., Felbeck, H. and Somero, G. (1987) Symbiosis in the deep sea, Scientific American, May 1987, 114-120. 13. Harborne, J. B. (1982) Introduction to Ecological Biochemistry, Academic Press, New York. 14. Urquhart, F. A. (1960) The Monarch Butterfly, University of Toronto Press, Toronto. 15. Brower, L. P. and Glazier, S. C. (1975) Localization of heart poisons in the monarch butterfly, Science 188, 19-25. 16. Reichstein, T., von Euw, J., Parsons, J. A. and Rothschild, M. (1968) Heart poisons in the monarch butterfly, Science 161, 861-866. 17. Ross, E. S. (1965) Asian insects in disguise, Natl. Geographic, 128 (3), 433-439. 18. Sisson, R. F. (1980) Deception: formula for survival, Natl. Geographic, 157 (3), 394-415. 19. Kettlewell, H.B.D. (1965) Insect survival and selection for pattern, Science 148, 1290-1296. 20. Brower, L. P. (1969) Ecological chemistry, Scientific American 220 (2), 20-29. 21. Platt, A. P. (1983) Evolution of North American admiral butterflies (Limenitis: Nymphalidae), Bull. Ent. Soc. Am. 29 (3), 10-22. 23. Malcolm, S. B. and Zalucki, R. P. (eds.) (1993) Biology and Conservation of the Monarch Butterfly, 419 pp., Natural History Museum of Los Angeles County, Los Angeles, CA. 24. Mosher, H. S., Fuhrman, F. A., Buchwald, H. D. and Fischer, H. G. (1964) Tarichatoxin-tetrodotoxin: a potent neurotoxin, Science 144, 1100-1110. 26. Davis, W. (1987) American Scientist interviews Wade Davis, American Scientist 75, 412-417. 27. Sheumack, D. D., Howden, M.E.H. Spence, I. and Quinn, R. J. (1978) Maculotoxin: a neurotoxin from the venom glands of the octopus Hapalochlaena maculosa identified as tetrodotoxin, Science 199, 188-189. 28. Kim, Y. H., Brown, G. B., Mosher, H. S. and Fuhrman, F. A. (1975) Tetrodotoxin: occurrence in Atelopid frogs of Costa Rica, Science 189, 151-152. 29. Daly, J. W. and Myers, C. W. (1967) Toxicity of Panamanian poison frogs (Dendrobates): some biological and chemical aspects, Science 156, 970-973. 30. Zahl. P. A. (1973) Nature's living jumping jewels, Natl. Geographic 144 (1), 130-146. 31. Dumbacher, J. P., Beehler, B. M., Spaude, T. F., Garraffo, H. M. and Daly, J. W. (1992) Homobatrachotoxin in the genus Pitohui: chemical defense in birds, Science258, 799-801. 32. Diamond, J. M. (1992) Rubbish birds are poisonous, Nature 360, 19-20. 33. Holloway, M. (1993) Pitohui! The colorful bird looks better than it tastes, Scientific American 268 (1), 20-21.